An Open Secret in the Hollywood film industry is that many Hollywood films—including films that do not seem to be stories about heroes—are shaped according to the mythological Hero’s Journey that author Joseph Campbell saw reflected in all world mythologies. Campbell, a friend of John Steinbeck, described The Hero’s Journey in his now-classic 1949 book, The Hero with a Thousand Faces. Once familiar with these patterns, the reader (or viewer) will see them everywhere in the stories around us. Now let’s ask ourselves: What ARE the elements of The Hero’s Journey? The Hero often begins in an ordinary world, and a call from a special world launches the story by luring The Hero into the unknown. Accompanied by archetypal companions such as the Mentor, the Threshold Guardian, the Shadow, the Shapeshifter, the Trickster and others, the Hero passes through several stages of the journey, becoming increasingly committed to the Quest—and increasingly unable to turn back—as he or she continues the adventure. The Hero is often presented with magical or significant objects on the way. He or she passes through ordeals, and encounters tests, allies and enemies. Once The Hero has reached the darkest point of the conflict—usually the climax of the film, he or she begins the journey back to the “normal” world, bearing the fruit of these adventures, strengthened and confirmed in his or her essential identity. The Hero often brings back a special power to the community through surviving these ordeals. While one might expect to find these patterns in fantasy films such as The Wizard of Oz, The Matrix, or Star Wars, a closer look at more realistic stories or even comedies through this lens will provide surprising insights. These building blocks also form the core stories of mainstream movies as varied as An Officer and A Gentleman, Titanic, The Firm, Field of Dreams, Patriot Games, East of Eden, Scarface, and Sister Act. In fact, they can be found in most films and stories. Earlier this year we heard the story of a young man over sixty years ago, who joined the Army, and left Salinas to serve his country thinking there was no chance he would ever be in harm’s way. Only to find himself at the mercy of an invading army who overran his base, and forced him and many other young men from Salinas to walk 60 miles on foot with little food and water, all while suffering from indiscriminate violence, torture, and murder as thousands of prisoners of war were forcibly moved to prison camps. We wondered what Joseph Campbell would see in his story. So, having heard so many heroic Salinas Stories like this one for the last year, we created this film series to take a look at the stories told to the national ear, where they come from, and how they relate to our own stories. As we thought about all of this we began to see stories in a different light. We also began to wonder if other people could see any, or all, of these various components that all come together to form a perfect story. One that takes you the reader/viewer/listener on a journey, teaches you something, and then sends you back out into the world to put what you’ve learned to use. We wondered if people knew how deeply rooted in our culture these story elements are? Is what author Joseph Campbell observed in every culture he visited, and laid out for anyone to see in his book, visible to you in any way? Can you point it out in your favorite stories? Can you point it out in your own life? Do you come from another culture, and recognize any of these elements in the stories you grew up with? What do you think of The Hero’s Journey? Please leave your comments by clicking on the word “comments” below. It’s Graphic Novel time at Salinas Public Library… now featuring Frank Miller’s Batman: The Dark Knight Returns! First appearing in the mid-1980s, this graphic novel continues the Batman story with dark themes and adult-oriented style. The non-stop action and plot twists will keep you hooked to the end. To learn more about this addition to Batman saga go check out this Wikipedia article. You can also check this book out at the Salinas Public Library! Click HERE for availability. What is the appeal of the Batman character? Clearly, he is disturbed and solitary, are these traits that people relate to? If you have seen the movie The Dark Knight, can you separate the Joker character from the image of Heath Ledger? How do you think the next movie will treat this character considering Ledger’s tragic death? Have the superhero stories become generally darker, that is, more disturbing? And if so, are recent popular graphic novels a reflection of our society? Please use the COMMENTS area below to leave your thoughts! We want to hear from YOU… so leave a comment TODAY. But if you can’t post a comment right now, at THIS EXACT MOMENT, please note that you can leave a comment ANYTIME. Welcome to our Online Book Discussion! 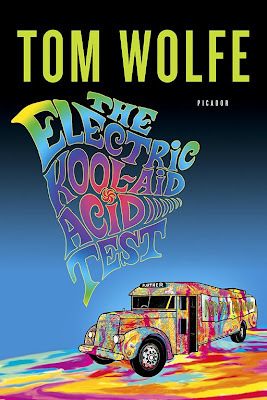 This June we will be featuring The Electric Kool-Aid Acid Test by Tom Wolfe. Join Ken Kesey and his band of Merry Pranksters as they drive across the country in a DayGlo painted school bus, reaching for personal and collective revelations through the use of psychedelic drugs. The book covers their cross country road trip, as well as Acid Tests, early performances by The Grateful Dead, and Kesey’s escape to Mexico. Reserve the book @ Salinas Public Library. This book has been in print now continuously for forty years, what is its popular appeal? Haven’t things changed? Using techniques originally described as New Journalism, Tom Wolfe attempted to capture a more complete description of his subject. But did he succeed? When we think of the sixties now how much of our judgment is clouded by this book? And how much of this really happened? These discussion questions are just a starting point. Please submit your responses in the “comments” area below. Thanks for your participation! And don’t forget that the posts will be continued AFTER June until the close of our centennial celebrations. It’s never too late to contribute! Dan Freeman, the spook who literally sat by the CIA’s door in Sam Greenlee’s 1969 novel, puts the “movement” in the Black Liberation Movement when he uses his spy training with the intelligence agency to train and deploy an urban guerilla force made up of the members of some of Chicago’s most notorious street gangs. Forty years later, though, the Black Liberation Movement has fallen out of vogue in our time when the spotlight was shined on comments made by President Obama’s former minister, Jeremiah Wright. Dan Freeman’s world was one of overt and covert racism and discrimination, perhaps justifying some of the vitriol heaped upon white characters in Greenlee’s satire. Is there still an air of racism and discrimination that would necessitate a modern day Black Liberation Movement? Would an active modern-day BLM require political and/or non-violent action? Is there smoldering violence just beneath the surface of everyday black experience that is just waiting for a riot to set it loose? Are there other racial and ethnic groups besides African Americans that may be preparing their own “freedom fighters” force? During April and May 2009 Mr. Wood’s Junior and Senior English classes at Everett Alvarez High School in Salinas are participating with the Salinas Stories program sponsored by the Salinas Library system and the National Steinbeck Center. It is an effort to study themes of history in Salinas, beginning in 1935. Students from Mr. Wood’s classes have set up this blog and will be submitting their responses. They would love to hear from others also. Please respond. …And the Earth Did Not Devour Him is composed of 27 episodes – 14 titled stories and 13 untitled vignettes placed between the stories. The first titled story (“The Lost Year”) introduces a young boy who has “lost” a year; the boy appears again in the last story (“Under the House”), having remembered the “year” he lost. The other 12 titled stories and the vignettes between them are the boy’s memories. The unusual statement and characterization of this novel challenge the reader to interpret a great many things that can ordinarily be taken for granted in more traditional novels. Below are questions that critics of this novel have debated a great deal. Let’s start our blog discussion by noting interpretations and any details from the novel that support them. 1. Is the person in the first episode the same one who goes under the house in the last episode? 2. Many of the episodes between the first and last have a young male as a main character. Is it the same young male in each episode? Is it the person who appears in the first episode? The last episode? 3. Is the “lost year” exactly 12 months? 4. Is the person who goes under the house merely confused or deeply disturbed? Does his psychological state change? Answer these, wait a day or two, then respond to others interpretations. In Book One—Fear, we are introduced to Bigger Thomas, a twenty year old black man, surviving in the Black Belt of 1930s Chicago. In the Sillen quote above, we get an idea of what life is like for Bigger— there is the “white” world, where all things seem possible, and the “black” world where opportunities are either limited or the “stuff” of make-believe. When Bigger’s world of poverty and discrimination converges with the privileged world of his employer, the Dalton Family, tragedy falls upon both the black and white communities of Native Son’s Chicago. Fast forwarding to the 21st Century, there are many that would say that we are in a “post-racial” world because of the election of Barak Obama, the product of a white mother and black father, as President of the United States. It may be premature to suggest that our country has completely moved on from the separation of races and classes of its citizens, but what do you think? Are your personal experiences more in line with Bigger’s “black” world, the Daltons’ “white” world, or are you living in the harmonic promise of an Obama Era where there is equality for all? Ellison is infamous for repitition, what do you think of the use of repeating refernces to buckets? Take a look at this speech from Booker T. Washington given at the Libety Paint Factory and see if it provides further meaning to the repeating image of the bucket. Think about the colors: gold, red, black, white, blue and gray in the novel. What themes and motifs and emphasized using colors to enhance significance?